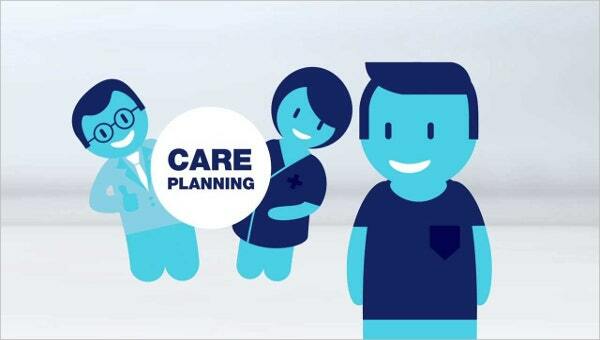 Most people regard care planning as a waste of time and resources. That should not be the case. 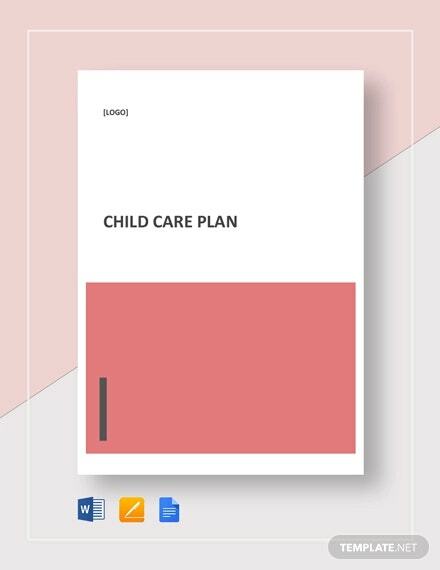 Like business plan and strategic plans, care plans are considered as road maps in assessing, treating, and ultimately maintaining an individual or group of individuals health condition. 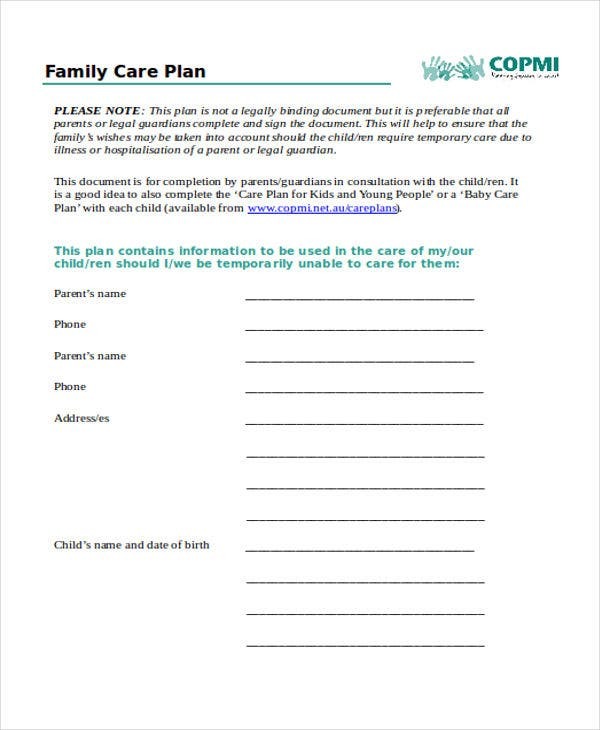 Care plans come in various types. 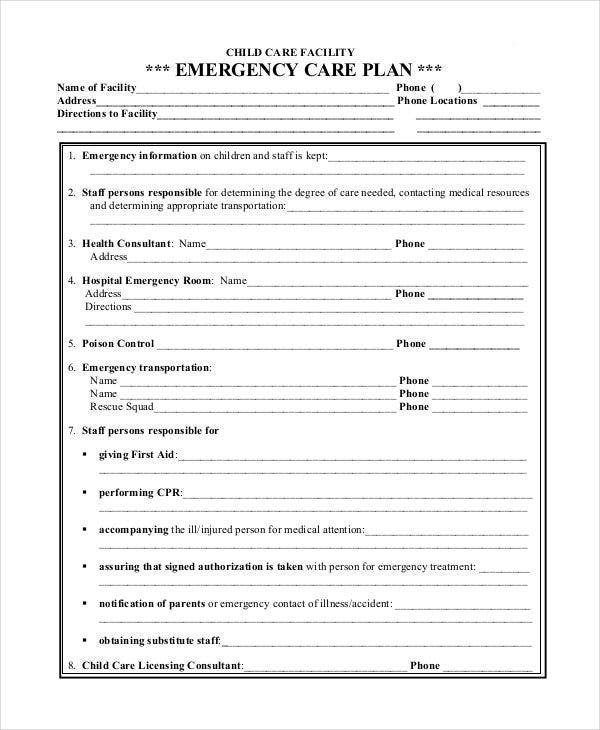 The most common types are the nursing care plans, mental health care plan, patient care plan, team care plan, and many more. 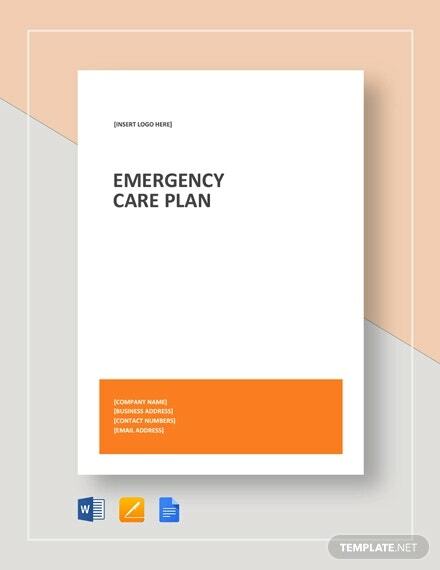 In line with this, there are care plan templates that are pre-formatted and available for download here. They can help you learn the basics of care planning or enrich your knowledge about the subject matter. 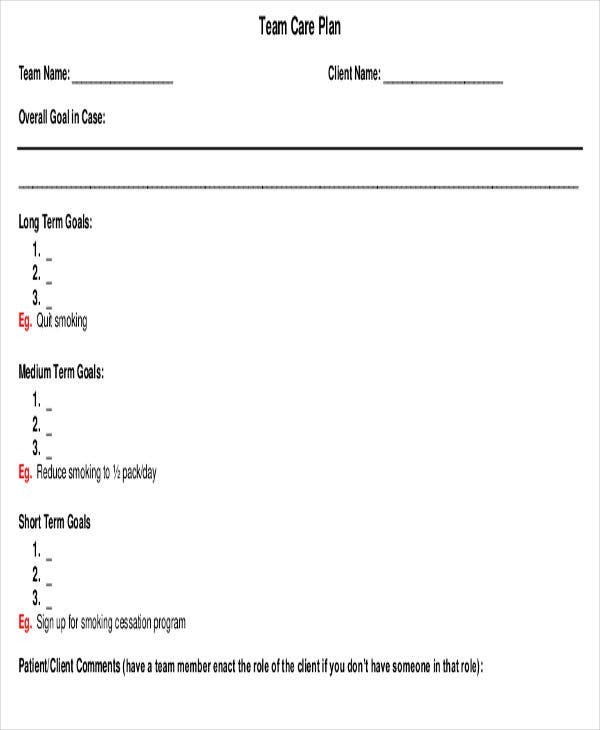 Involves assessment procedures. 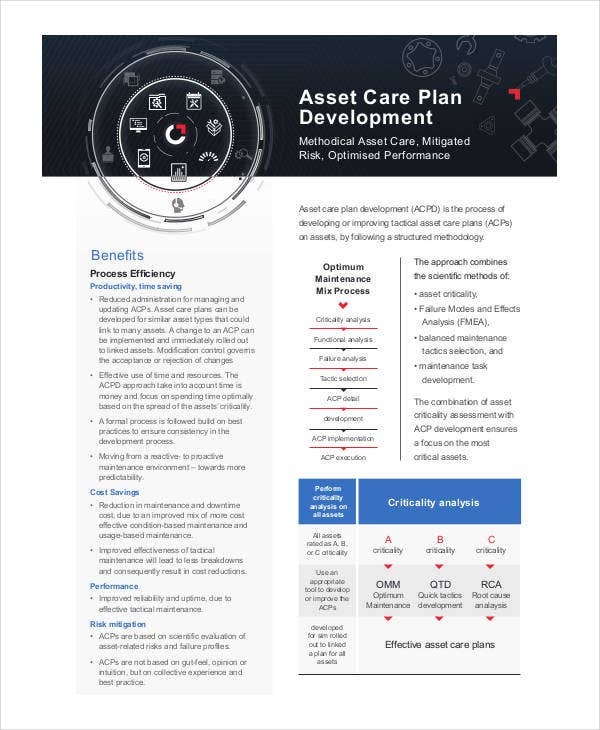 Like business plan templates, assessment processes are also evident in the making of care plans. 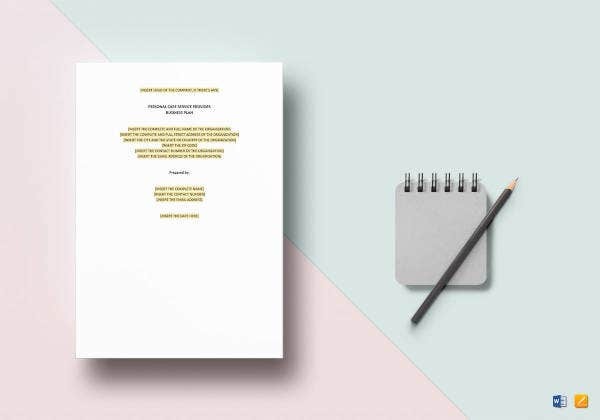 The determination and assessment of health, social, and educational context of the individual or groups of individuals must be conducted holistically. 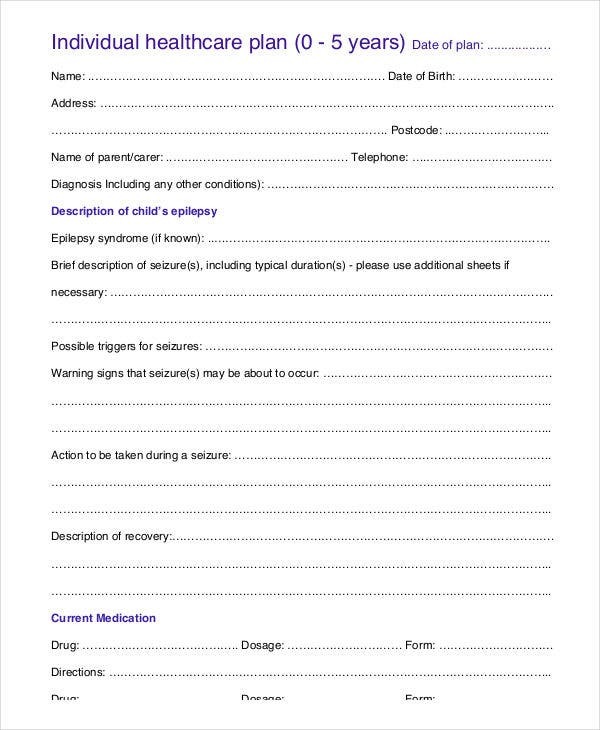 Coming up with suitable intervention measures. 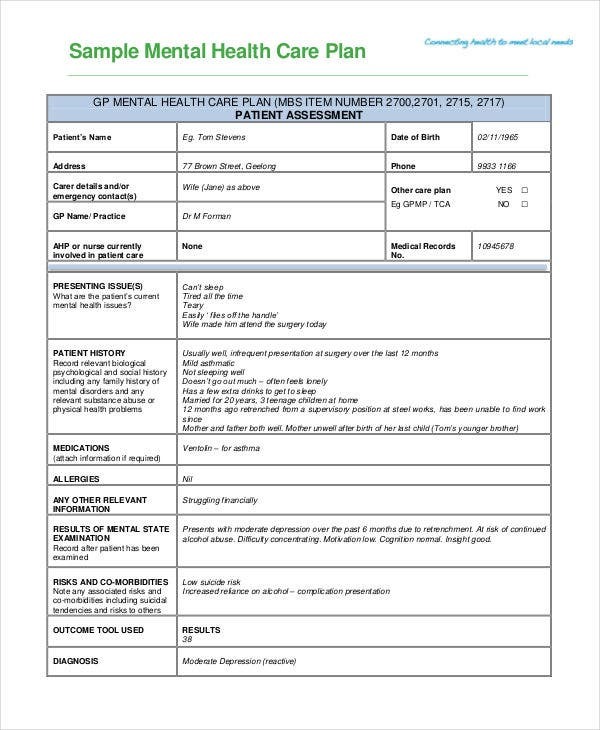 After a thorough assessment is conducted, the care plan must provide strategies and intervention measures that can suffice the health and social welfare of the individual. 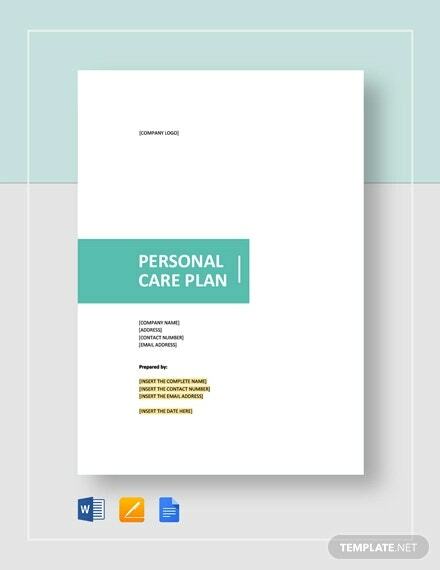 Because of this feature, care plans are closely associated with personal development plans specifically when it comes to the mental well-being of the individual. Plan implementation. In the end of the day, plans should not become mere documentations and by the book procedures. The plan must be implemented and felt by its beneficiaries. 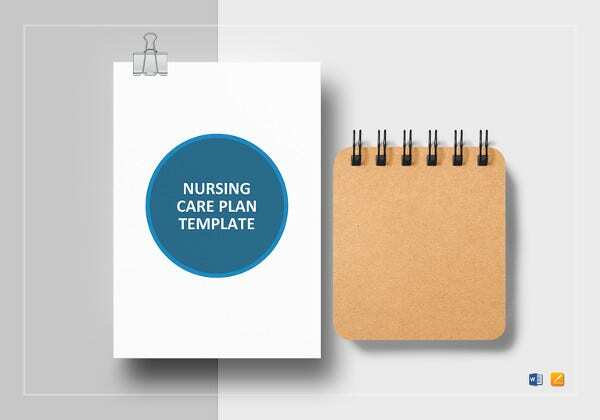 Nursing Care Plan Templates – These care plan templates are used by nurses or nursing students in mapping out their health plans for a particular individual or group of individuals. 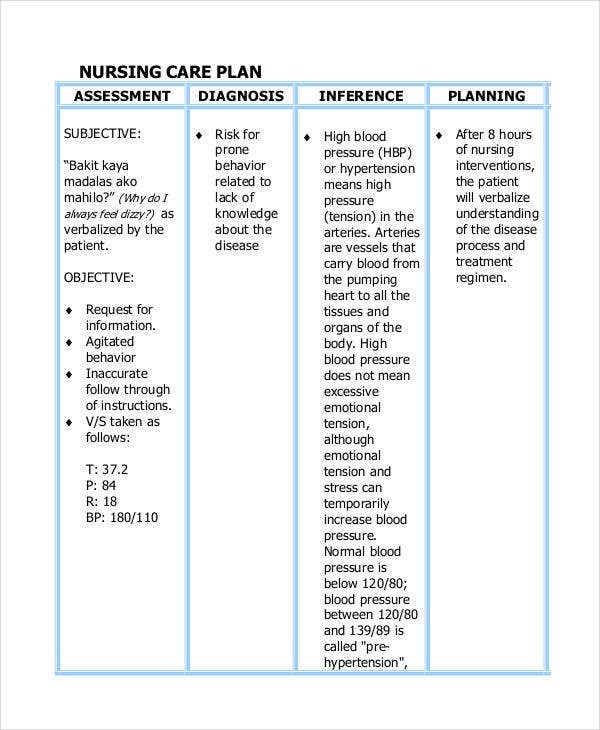 In your nursing plan, you can include specific components such as the assessment, diagnosis, inference, and planning techniques. 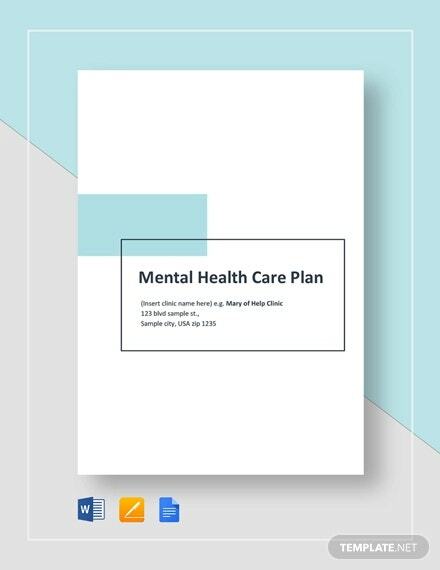 Mental Health Care Plan Templates – For people who have mental health disorders, doctors come up with a mental health pan after thoroughly assessing and diagnosing the patient. 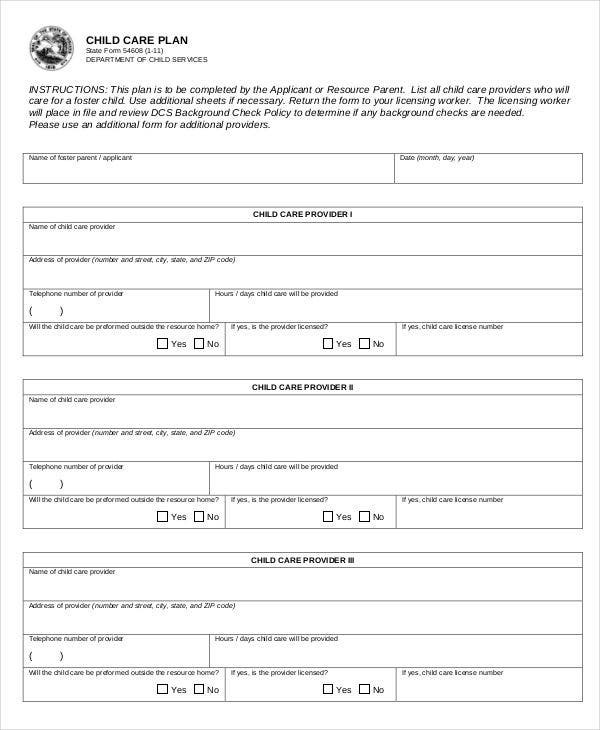 As you may observe in the mental health plan template, the care plan covers the patient’s assessment details such as his or her history, medications, results of the mental state of the patient, and any other relevant information. 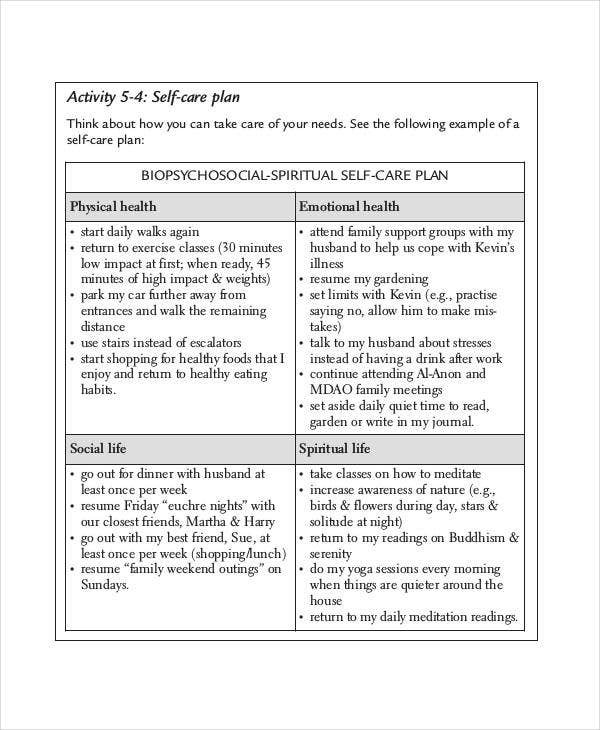 Self-Care Plan Templates – In a more personal level, you can also come up with your own care plan as long as you have the utmost commitment to discipline yourself to undergo the said process. 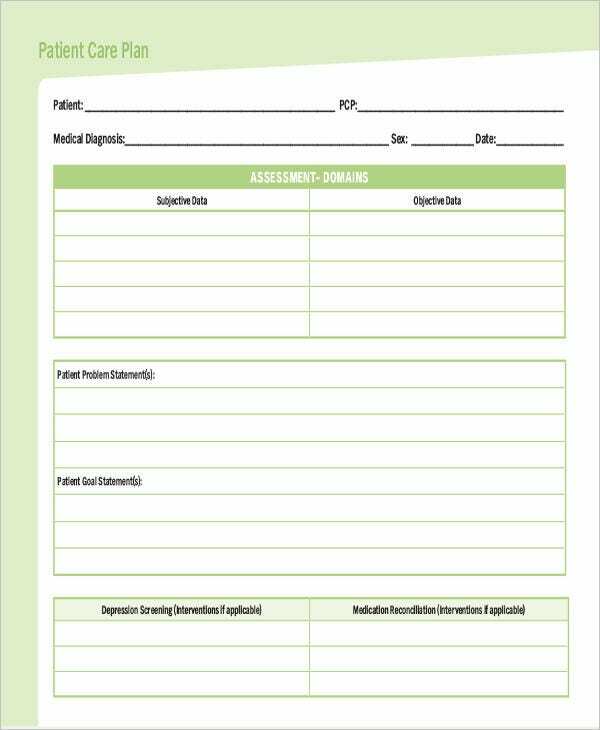 What is important is that you consult your physician before coming up with your plan specifically for your health needs. 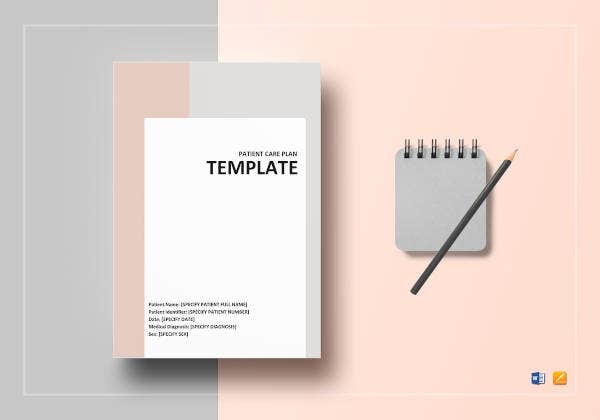 Furthermore, you can also come up with a financial plan template to monitor your expenses and usage of resources which can also affect your overall self-development. 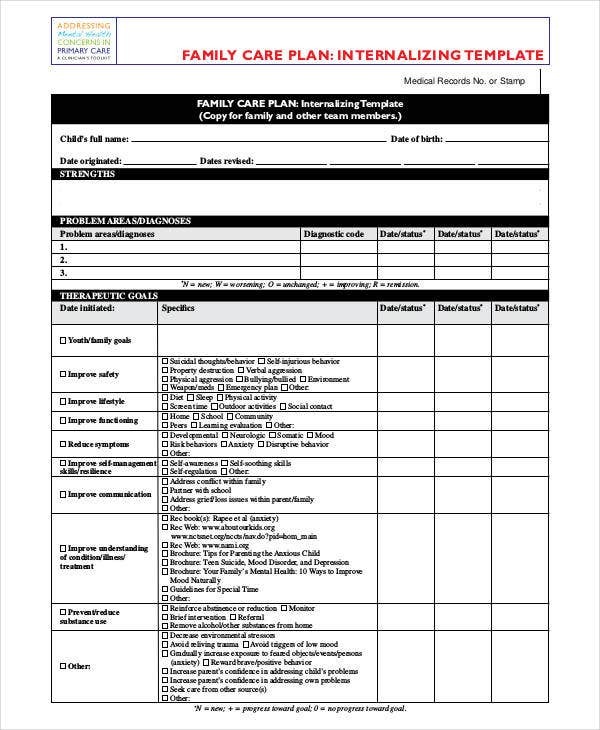 Caring for your patients takes priority so make sure to choose the care plan template that suits the needs of both you and your patient/s.